Technology advancements coupled with increasing regulatory oversight have spawned widespread change throughout the retirement landscape. The Department of Labor’s ever-present fiduciary rules have introduced a host of new compliance complexities and additional liabilities for employers and plan sponsors offering retirement benefits and related financial advice to employees. 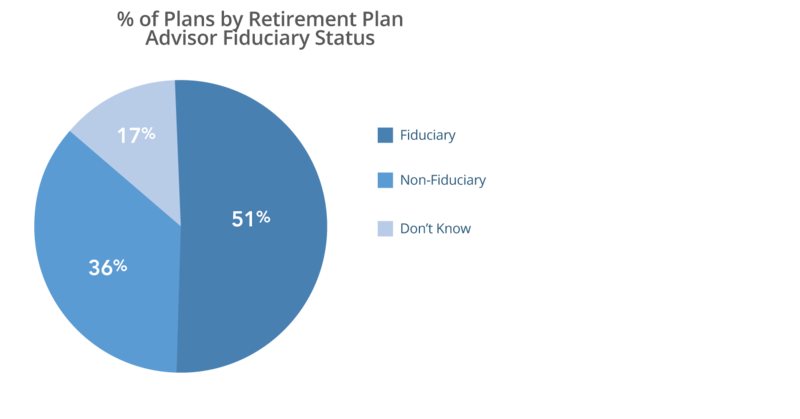 The heightened regulatory atmosphere has driven many plan sponsors to alter how they approach offering retirement products, with many choosing to outsource at least some portion of their retirement responsibilities to specialized retirement advisors that can support and augment their delivery model to participants. With so much of the market utilizing advisors, Chatham Partners sought to establish a service baseline of how these advisor/sponsor relationships were working in practice, striving to unveil the organic level of satisfaction plan sponsors have with the advisors they use today to help manage their retirement assets. Our survey results uncovered a bit of a surprise. Although 81% of survey respondents indicated a relatively high level of overall satisfaction, their satisfaction had low correlation to their loyalty. At Chatham Partners, we see tremendous value in dissecting true loyalty from mere satisfaction. Our experience has shown that this informational nexus of satisfaction and loyalty provides a tremendous gateway for product and service improvements that can lead to greater client retention and deeper loyalty. At Chatham, we dig beyond surface level satisfaction. Our proprietary loyalty algorithm allows us to uniquely identify clients that are “at risk”. What we uncovered in our recent survey is, and should be, a startling reality for some retirement plan advisors – only 1 in 5 respondents possess true loyalty. Data from the survey showed that 60% of plan sponsors sit in a “neutral” territory when it comes to their loyalty to retirement plan advisors, and 18% represent truly “at risk” characteristics. In our opinion, the sizeable neutral zone represents a wide swath of plan sponsors that are less than loyal to their advisors and could be ripe for renegotiating current relationships or even changing providers. The potential money in motion provides an enormous opportunity for the advisor community to retrench and retool their offerings with employers and DC sponsors and enhance service and product offerings in a way that genuinely creates more loyal customers. Data from the survey also uncovered that satisfaction varies by size of the plan sponsor, with mid-sized firms ($10-$50 million in plan assets) clearly having lower levels of overall satisfaction compared to smaller or larger plans. To identify areas of service improvement by segment, we applied a correlation analysis to each of the plan segments to show which provider attributes had greater relative importance across plan sizes. Notably, there was lower overall satisfaction and wider, more systemic dissatisfaction with many plan attributes noted by respondents of firms with mid-sized plans. The mid-sized plan emerged as an additional opportunity for advisors to assess their current book of business and ensure that their most profitable and strategically important customers are loyal, or made more loyal, with enhanced and targeted servicing. Finally, in terms of noteworthy results, the survey allowed us to identify key areas of importance that plan sponsors feel advisors have fallen short on. Communication, proactive innovation and thought leadership, financial advice and supporting plan sponsor success came to the fore as areas where advisors could improve and differentiate themselves from other providers. We are enthusiastic about the survey findings and the tremendous informational tools and analytical power the survey results can provide retirement advisors to help them improve and maximize both the profitability and volume of current and new relationships. We hope you share in our excitement with the results and gain valuable insights that lead to greater customer loyalty and more informed and profitable business decisions.Click edit button to change this text. 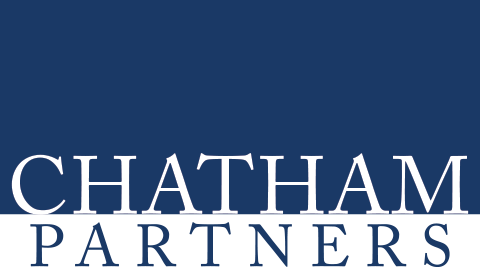 Chatham Partners has helped assess levels of satisfaction and loyalty across the retirement plan business for over 25 years, including measuring satisfaction among retirement plan sponsors and participants, third party administrators, and plan advisors. 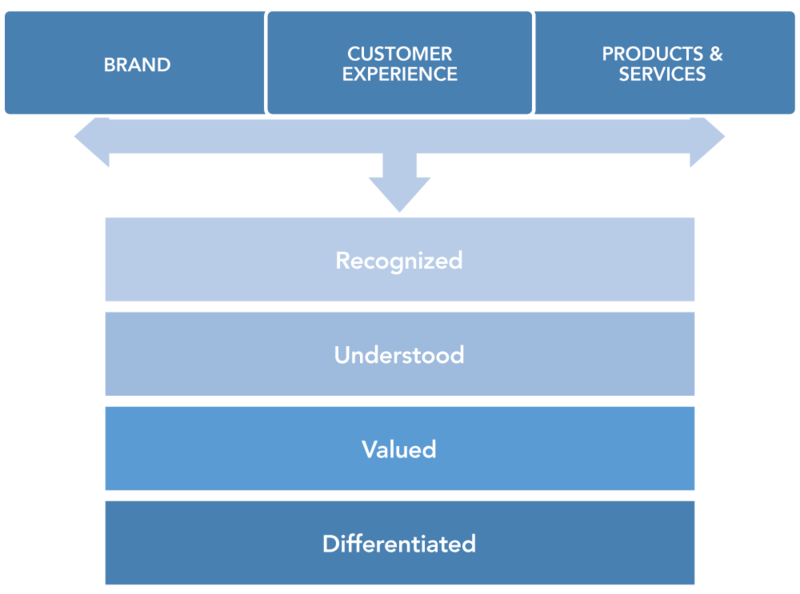 To help industry players fully understand their position in the marketplace, Chatham Partners looks across the three main components of the client relationship (brand, customer experience, and products and services) within three segments of decision makers (prospects, clients, and advisors). 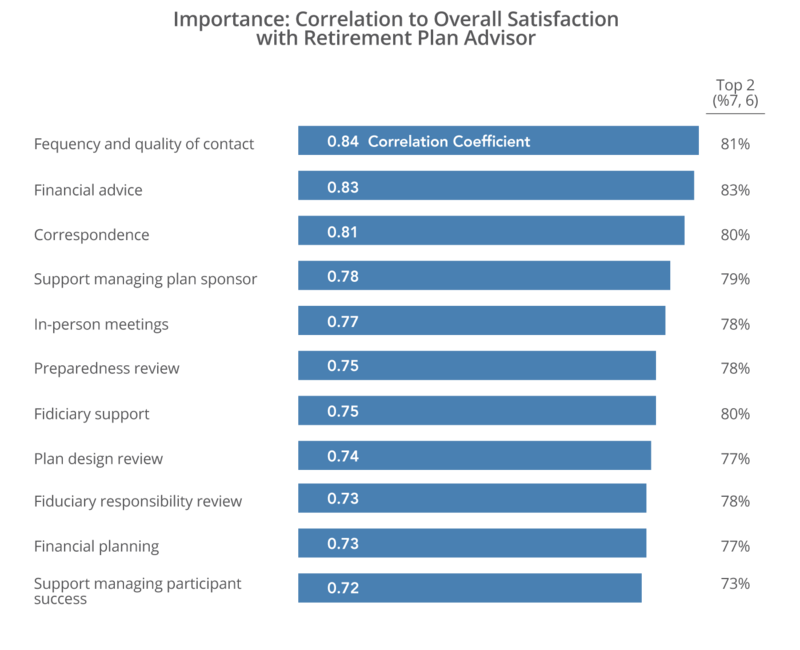 Are plan sponsors satisfied with their advisors? What drives their satisfaction? To what extent are plan sponsors loyal to their retirement plan advisors? What variables contribute to differences in satisfaction and loyalty among plan sponsors? Are there aspects of advisors’ offerings which are consistently perceived as strong or weak? What is the relative importance of various service attributes and how do they impact plan sponsor loyalty? What steps can the retirement advisor community take to ensure that their services are optimally suited for their clients’ needs? In Q2 2017, Chatham Partners gathered data via an online survey that solicited employers with qualified retirement plans. To ensure respondents had ample knowledge of the products and services offered within their retirement plan, only contacts with decision-making authority or influence on retirement plan decisions were surveyed. 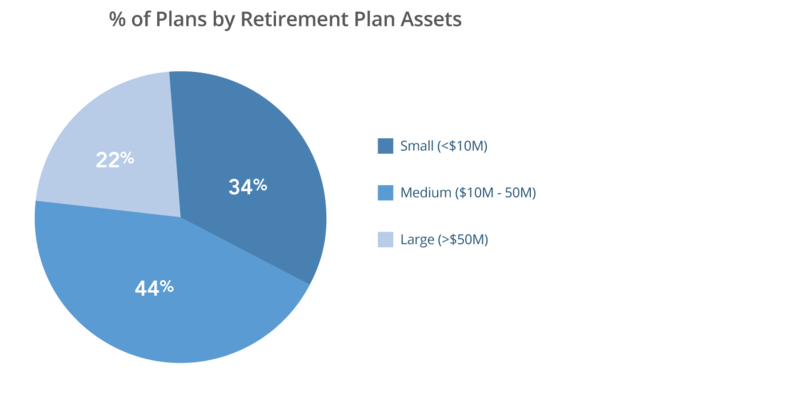 In addition, only plans that currently utilized a retirement plan advisor were included in the sample. 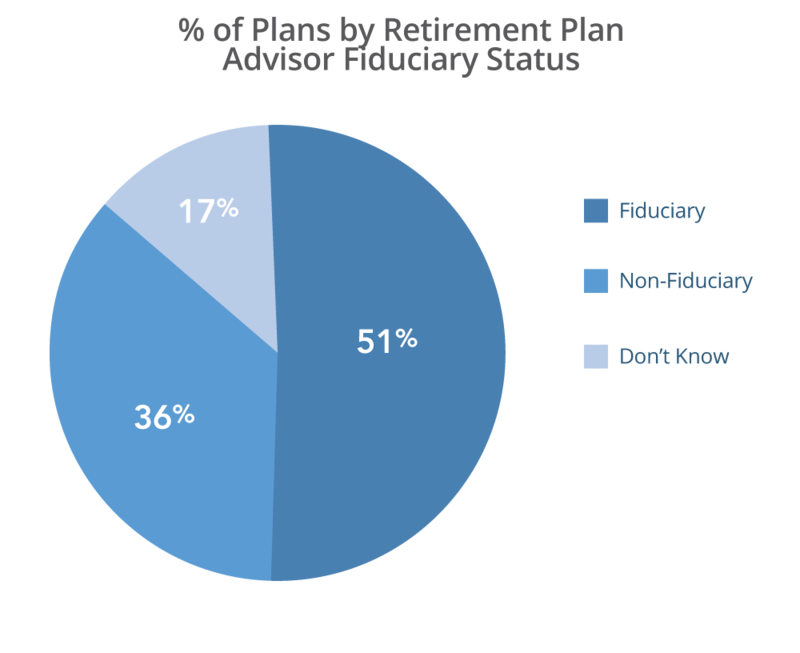 In addition, responses are segmented by plans with retirement plan advisors that act as 3(21) or 3(28) fiduciaries compared to those with non-fiduciary advisors. Quantitative questions were rated on a 7-point scale in which ‘7’ represents “Very Satisfied”, and ‘1’ represents “Very Dissatisfied”. 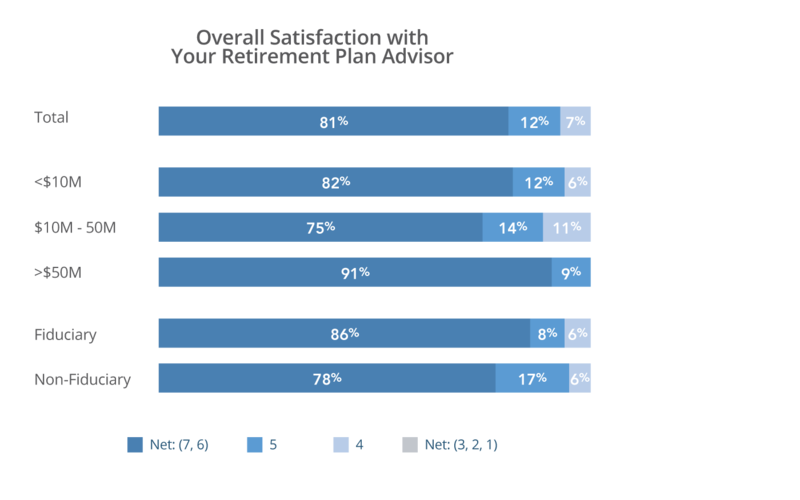 Overall, results indicate that plan sponsors are generally satisfied with their retirement plan advisors, with 81% of plan sponsors surveyed rating their overall satisfaction with their advisor a ‘7’ or ‘6’ on a 7-point scale. Plan sponsors also provide strong ratings (79-81% top 2 box score) for advisors’ quality of contact, ability to help manage plan sponsor success, and fiduciary support. However, support in managing participant success emerged as an opportunity for improvement, with a relatively lower top 2 box score of 73%. An important indicator of success for any business is the loyalty of its customers. Through Chatham’s proprietary loyalty algorithm, it is possible to identify clients that are at-risk of leaving, as well as those who can be used for positive reference. 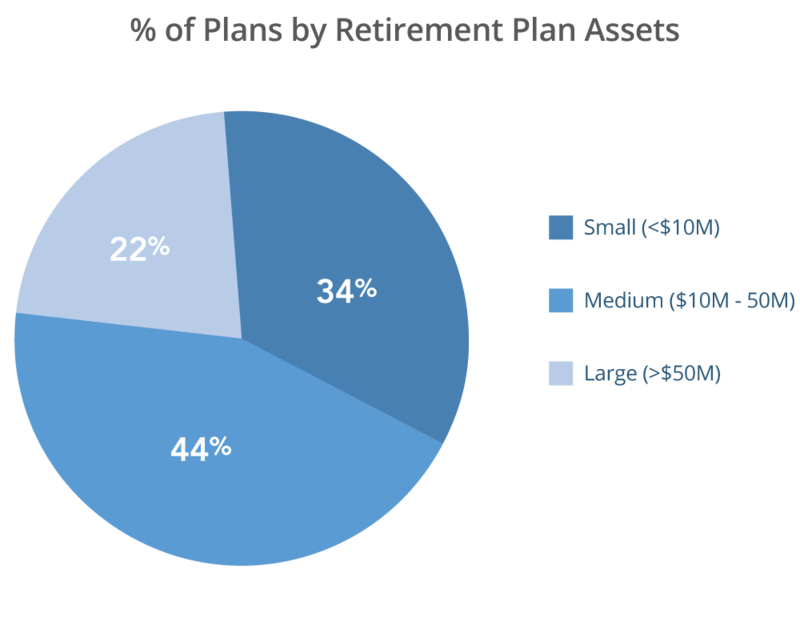 Based on this study’s results, a large portion of plan sponsors are “neutral” toward their retirement plan advisor, and approximately 1 in every 5 respondents are classified as “at-risk” accounts. This leaves only 22% of respondents who are considered “loyal” clients. It would be in the best interest of advisory firms to assess their current book of business and strive to ensure their most profitable and strategically important customers are “loyal”, while taking steps to address concerns of identified “at-risk” accounts. 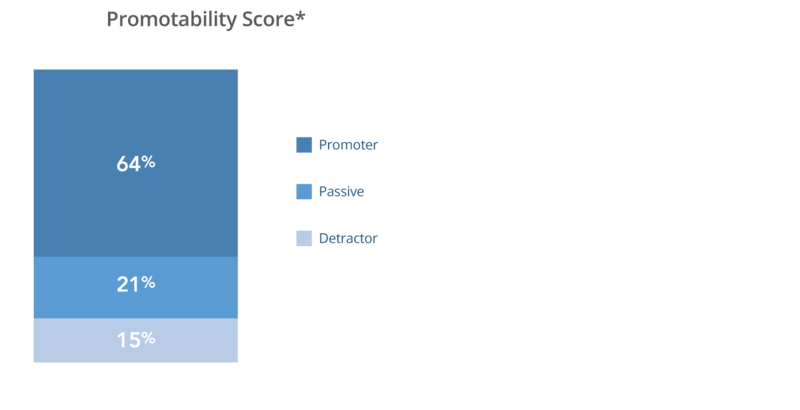 The Promotability Score acts as a simple barometer for how one firm is doing versus another or versus the industry as a whole. With the results of this study, Chatham Partners has developed a unique baseline Promotability Score for retirement plan advisors that can be used for comparison to other advisory firms. 64% of the surveyed plan sponsors are determined to be promoters, while 15% are detractors, translating to a Promotability Score of 49. 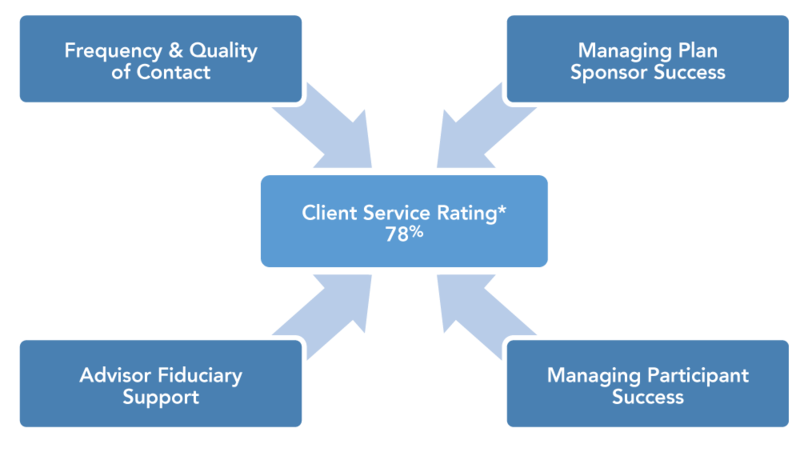 The Client Service Rating depicted below is a proprietary metric developed by Chatham that takes a comprehensive view of the components of service. 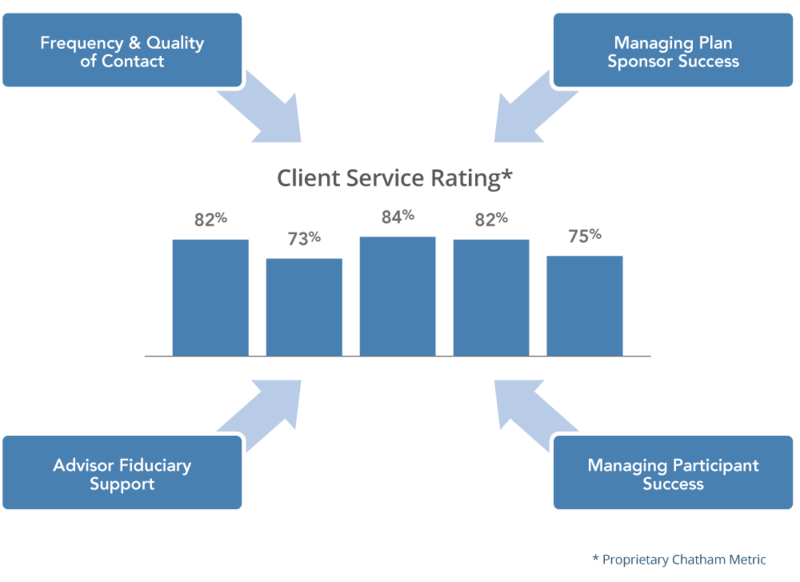 The Client Service Rating is derived by combining the individual top 2 box scores provided for the frequency and quality of contact, plan sponsor services, advisor fiduciary support, and participant services. Plan sponsors’ scores indicate that there is room for improvement when it comes to retirement plan advisors’ provision of holistic service. A deeper dive into the components that make-up the Client Service Rating reveals that sponsors are generally satisfied with the frequency and quality of contact (81%), advisor fiduciary support (80%), and support managing plan sponsor success (79%). 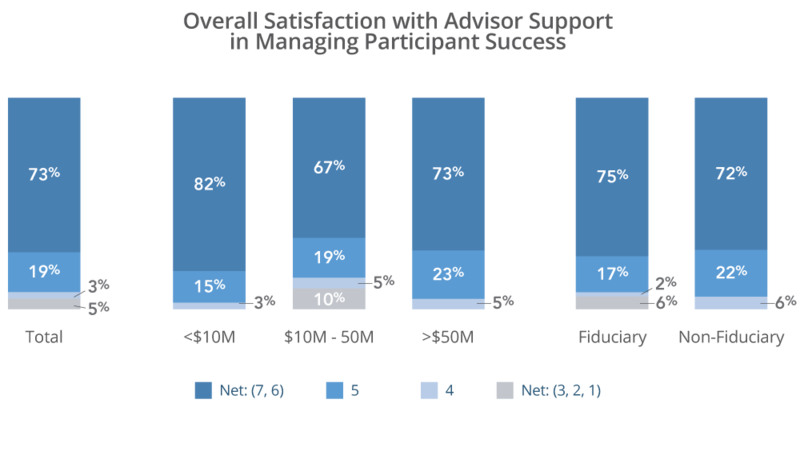 However, advisor support in managing participant success is viewed less favorably, as this area receives a comparatively low 73% top 2 box score. Ideally, an aggregate top 2 box score would be in the 80%+ range to be considered strong. Regardless, the industry Client Service Rating of 78% is the benchmark against which individual advisory firms can measure their own service effectiveness. Results are mixed when ratings for brand attributes are assessed. Advisors receive stronger marks for service related attributes such as treating clients as important, ease of doing business, and range of services offered, with top 2 box scores of 79% or higher for these measures. Conversely, ratings are notably lower for measures associated with innovative and proactive partnership, as scores for ‘is innovative’ and ‘proactively offers new ideas and solutions’ are in the middling range, and below levels that ensure deep satisfaction or loyalty. Correlation analysis was utilized to identify attributes most highly correlated to overall satisfaction with retirement plan advisors. The frequency and quality of contact, which includes in-person meetings and other correspondence (phone calls, emails, updates, etc. ), is the most highly correlated to overall satisfaction and received a strong 81% top 2 box rating. 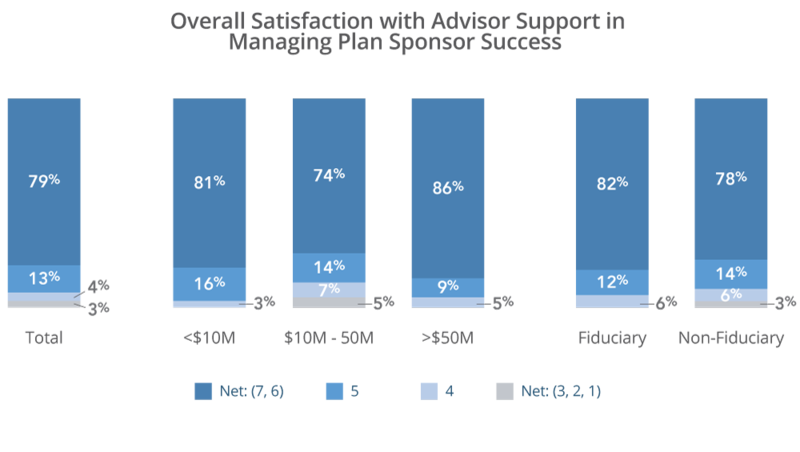 Financial advice and support in managing plan sponsor success are also highly correlated to plan sponsors’ overall satisfaction with their advisors and receive strong top 2 box ratings. 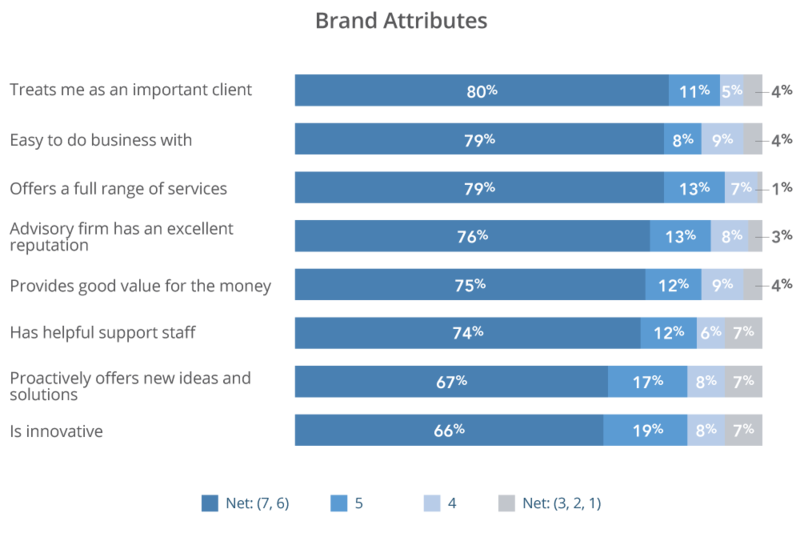 However, managing participant success – which has high relative importance to plan sponsors – came in under 80% top 2 box, and emerges as a place advisors could improve services. The above scores are reflective of the industry as a whole and give a high-level understanding of employers’ perceptions of the services provided by retirement plan advisors. But, given the complexity of the market and the variations of service models for different size plans, more insight can be derived by analyzing results across different asset segments. In the following section, segmentation analysis reveals that differences in satisfaction exist within the respective client segments. While, as a whole, the market has a positive view of advisors (81% top 2 box score), this sentiment is relatively weaker among plan sponsors with mid-size retirement plans and those with advisors that do not act as a fiduciary. For advisory firms that service mid-size plans and / or choose not to act as a fiduciary, there is an opportunity to differentiate themselves from their peers in the same segment by making targeted efforts to address shortfalls perceived by this client base. Small and large plan sponsors and those with advisors that act as a fiduciary were most satisfied with the contact they receive, while mid-size plan sponsors and those with non-fiduciary advisors provide comparatively lower scores. In particular, mid-size plan sponsors appeared to be less satisfied with the advisor’s level of preparation for in-person meetings as well as the frequency and quality of other correspondence. Plan sponsors with non-fiduciary advisors were less satisfied with the value of and advisor’s preparation for in-person meetings. Plan sponsor services are fundamental to an advisory firm’s core product offering. To analyze satisfaction in managing plan sponsor success, we asked employers to evaluate the quality, value, preparation, and frequency of their advisors’ reviews of investments, fees and expenses, and plan design. 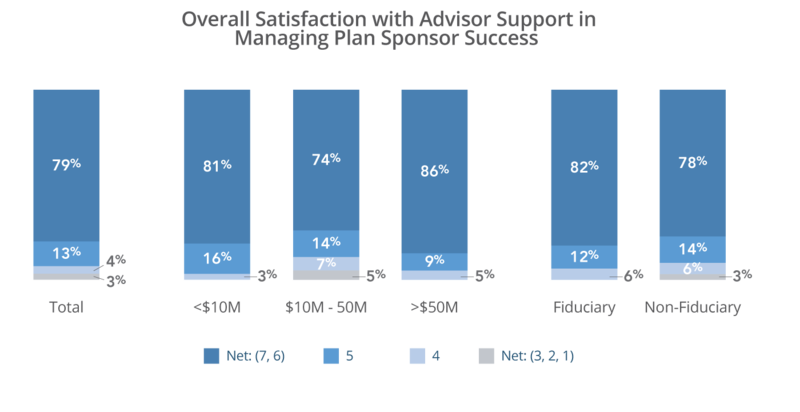 The top 2 box score for plan sponsors’ satisfaction with advisor support in managing plan sponsor success is 79%. 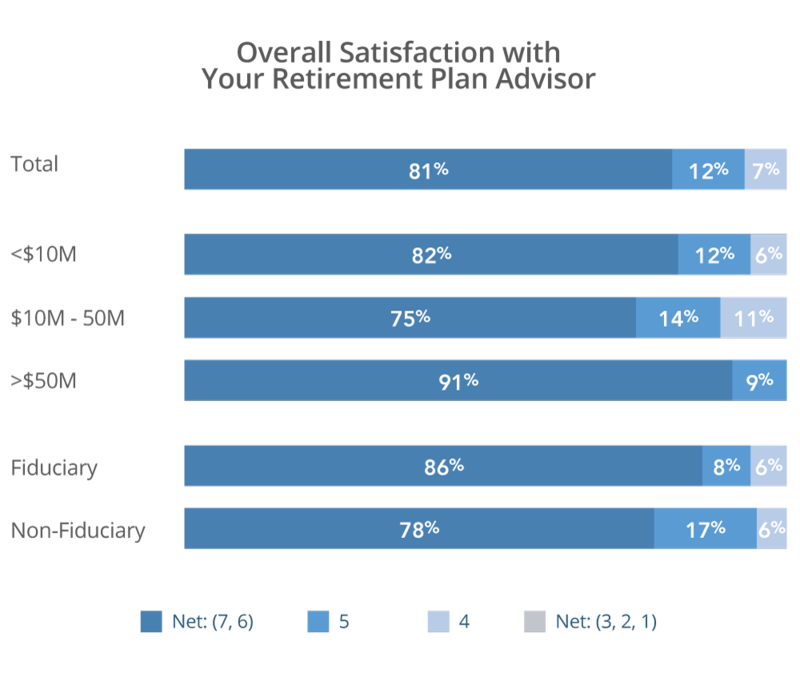 Similar to other areas of the survey, mid-size plan advisors and non-fiduciary retirement plan advisors receive lower scores than the industry as a whole. Among the components of managing plan sponsor success, mid-size and large plan sponsors provide considerably higher ratings than small plan sponsors for satisfaction with investment menu reviews, while mid-size sponsors provide the lowest ratings for satisfaction with plan fees and expense reviews, as well as plan design review. 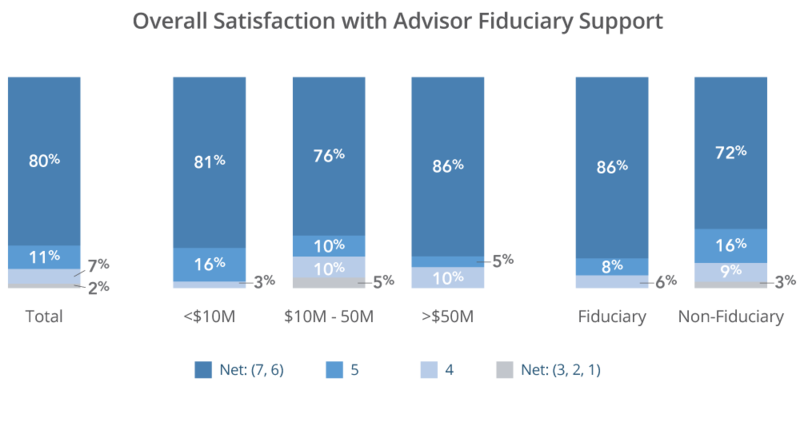 Plan sponsors express a high level of confidence in the fiduciary support provided by their advisors, with 80% rating their overall satisfaction with advisor fiduciary support in a top 2 box. 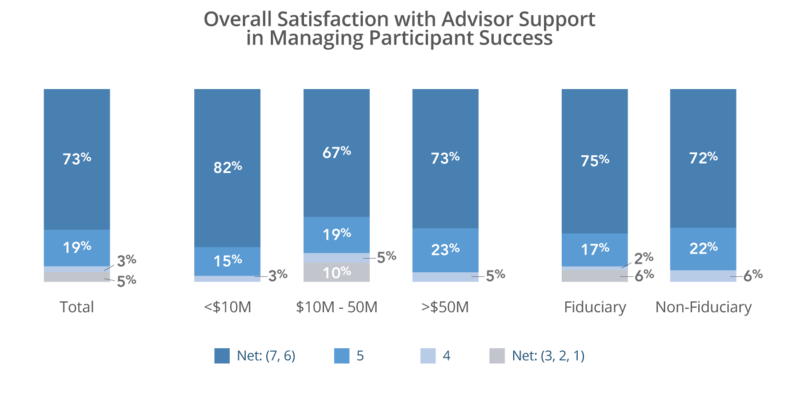 As expected, there is a considerable difference in perceptions of advisor fiduciary support between plan sponsors with advisors who are acting as fiduciaries and those with advisors who are not. Nevertheless, strong ratings are given for the frequency and quality of plan sponsor fiduciary responsibility review across all segments. 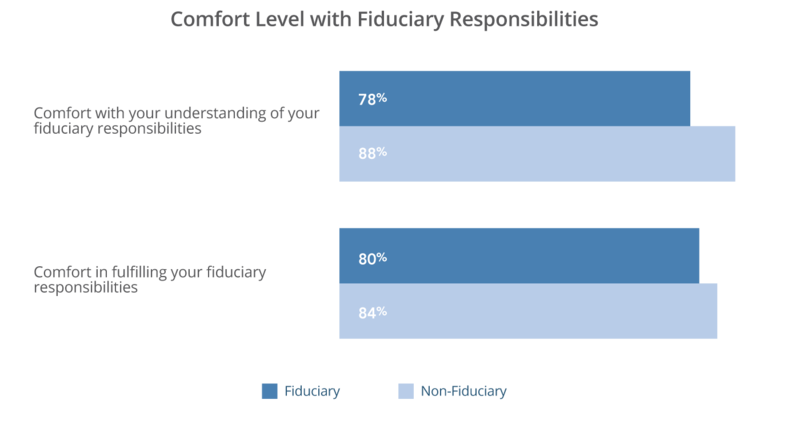 Interestingly, plan sponsors who utilize a non-fiduciary advisor are less satisfied with their fiduciary support, yet are more comfortable with their understanding of their fiduciary responsibilities and their comfort in fulfilling those responsibilities. Support in managing participant success is a critical component of an advisor’s offering. While findings track closely when segmented by fiduciary and non-fiduciary advisors, satisfaction varies among plan sizes. Specifically, small plan sponsors are more satisfied with the advisor support they receive in managing participant success relative to large and mid-size plan sponsors, likely due to having fewer participants who can receive more personalized support. 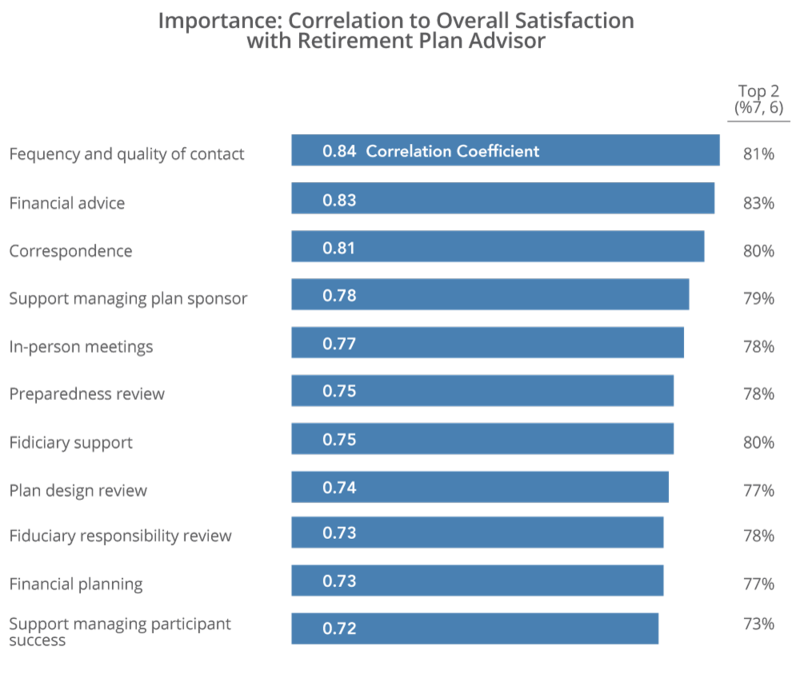 Among the specific participant services, plan sponsors display the highest relative levels of satisfaction with the financial advice provided by their plan advisors, while education and enrollment meetings and financial planning services receive slightly lower ratings. At a more granular level, small plan sponsors are more satisfied with education / enrollment meetings and financial planning, while large plan sponsors are more satisfied with financial advice. Further, large plan sponsors provide the highest relative ratings for preparedness reviews, while mid-size plan sponsors give the lowest relative scores for this area. When segmented by plan size, the composite Client Service Rating further emphasizes that small- and large-market plan sponsors are most satisfied. Advisors earn top 2 box scores exceeding 80% for their client service effectiveness among small- and large plan sponsors and only 73% among the mid-size plan segment. In addition, advisors acting as fiduciaries receive a higher Client Service Rating rating than advisors who are not. There are several areas where advisors can improve and deepen loyalty with enhanced product and service offerings. 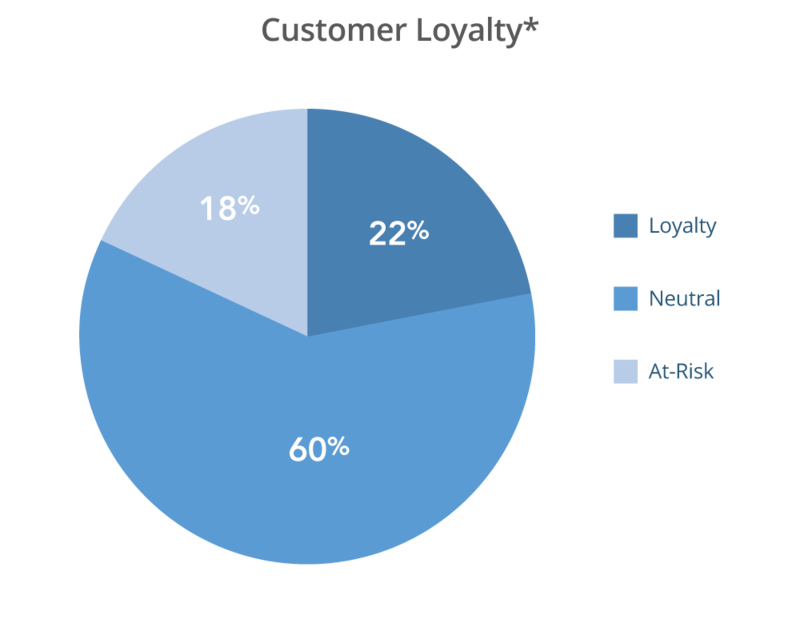 Chatham Partners’ proprietary loyalty algorithm reveals that 60% of plan sponsors are “neutral” in terms of their loyalty to their retirement plan advisor, and 18% are “at-risk”. Given only 1 in 5 plan sponsors demonstrate loyalty to their advisors, advisors should address the concerns of “at-risk” accounts and ensure their most valuable clients recognize the value of their offering. 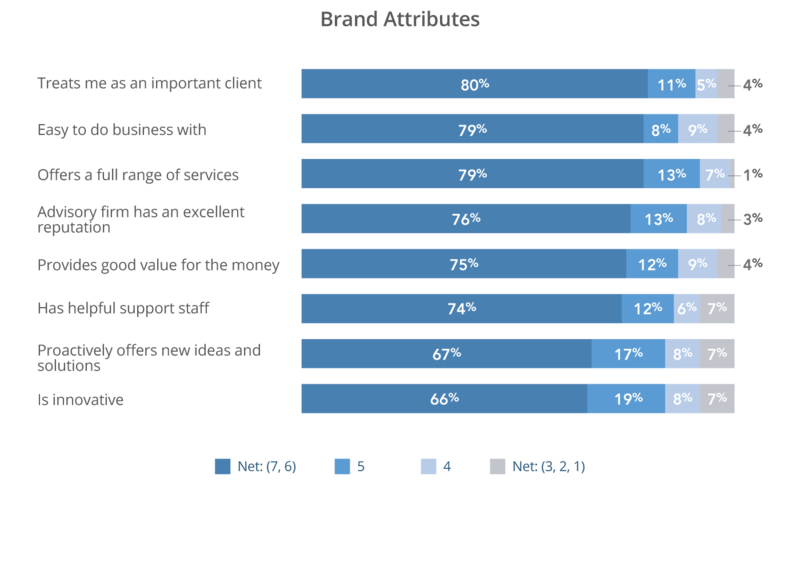 By focusing on the services which are most strongly correlated to sponsors’ satisfaction, such as communication, financial advice, and support in managing plan sponsor success, client loyalty would likely be bolstered. As sponsors look to move beyond simply providing a window for investments, advisors can assist in improving retirement outcomes and participant success. 81% of plan sponsors provide strong ratings of ‘7’ or ‘6’ for their overall satisfaction with their advisors. Moreover, no plan sponsors provided scores of less than ‘4’. 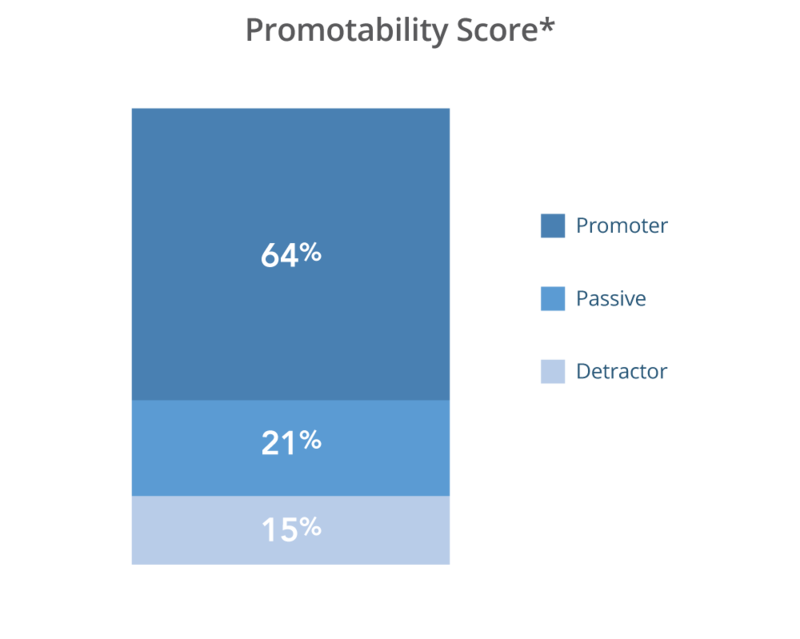 The benchmark Promotability Score is 49, as 64% of respondents were classified as Promoters, and only 15% were considered Detractors. As plan sponsors look to improve outcomes and savings for participants, managing participant success emerged as both an important differentiator for plan sponsors as well as an area that advisors could improve upon. Key components of managing participant success include simplifying and automating investment decisions that lead to greater participation, enhancing participant diversification to ensure higher replacement incomes at retirement, and increasing participation in the use of advice tools. The quality of an advisors’ communication is of crucial importance for plan sponsors, but advisors need to dig deeper and expand efforts beyond customary service contact points to differentiate and add value to their communications with plan sponsors. Correlation analysis reveals that attributes relating to the interactions employers have with advisors (frequency and quality of contact, in-person meetings, and other correspondence) are most strongly correlated to overall satisfaction with advisors. 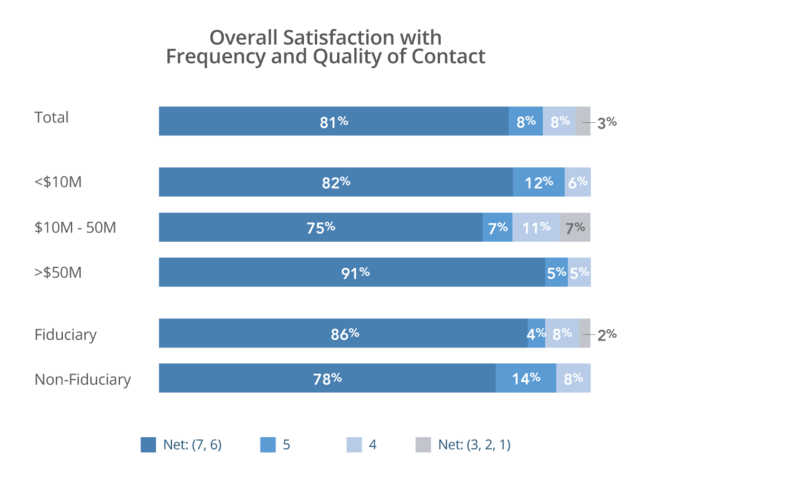 Results suggest that many advisors are executing in these key areas, as frequency and quality of contact (81%), correspondence (80%), and in-person meetings (78%) receive strong top 2 box scores. Advisors can likely enhance their value by adding communication strategies and thought leadership that can assist plan sponsors with connecting improvement goals to actions such as increasing participant savings rates, automating enrollments, bettering diversification and allocation strategies, augmenting financial planning strategies, and customizing target date product offerings. Client service, particularly support for participants, can be further improved to suit plan sponsors’ needs.• Client service, particularly support for participants, can be further improved to suit plan sponsors’ needs. 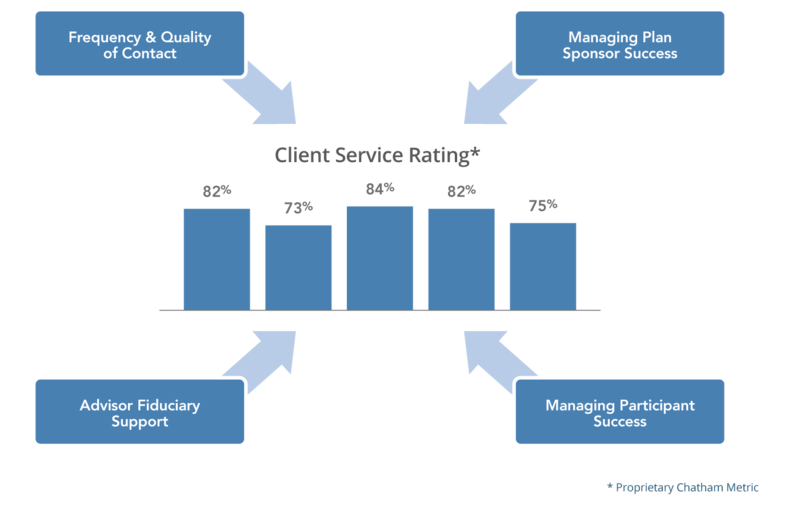 The top 2 box score for client service, a composite measure, is 78%. 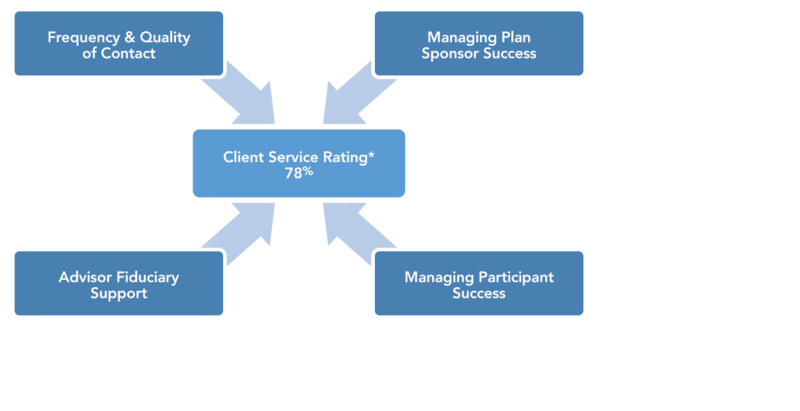 The weakest element of the Client Service Rating is advisor support in managing participant success, which receives a top 2 box score of only 73% at the industry level. 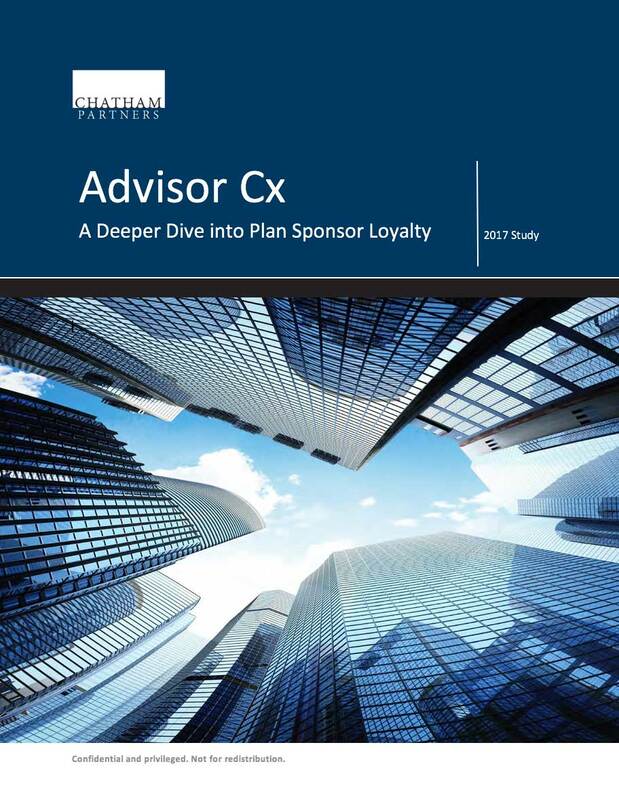 Advisors can provide stronger client servicing to plan sponsors, especially to mid-sized and non-fiduciary plans, to strengthen their relationships with plan sponsors. Advisors would likely be well served in approaching sponsors through their client service touch points to query on a more targeted basis those elements of their offering that have the most meaning and require more immediate attention to improve overall satisfaction and loyalty. Mid- sized plans ($10- $50 Mil) and plans where the advisor does not function as a fiduciary emerged as having lower overall satisfaction compared to both small and large plans. The underserved needs of this middle market represent a key area of focus where advisors can enhance product and service offerings. Sponsors of small and large plans are consistently more satisfied with evaluated measures than their mid-size plan counterparts. Sponsors of small and large plans are consistently more satisfied with evaluated measures than their mid-size plan counterparts.o In addition, advisors that act as a fiduciary receive higher marks for their services than those that do not act as a fiduciary. When it comes to mid-sized and non-fiduciary plans, there appear to be several relatively simple improvements advisors can make that will lead to greater satisfaction, including preparedness for plan reviews and general elements of client service and contact. Mid-sized and non-fiduciary plan segments also exhibited much lower scores in terms of managing participant success compared to small or large plans, which, according to the overall survey results, is an area of improvement that advisors clearly can facilitate across the board with all segments. 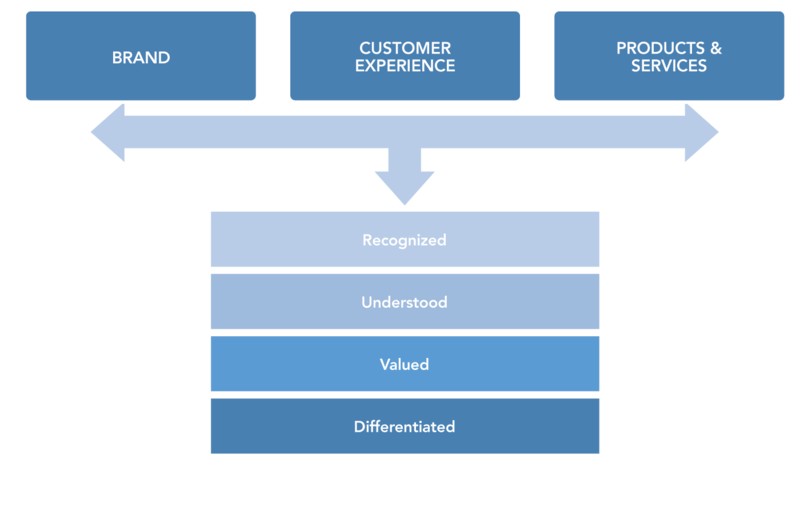 Product and service innovation and thought leadership are areas in which advisors can improve and differentiate their offerings. • Product and service innovation and thought leadership are areas in which advisors can improve and differentiate their offerings. Only two-thirds of respondents strongly agree that their advisor proactively offers new ideas and solutions or is innovative (67% and 66% top 2 box scores, respectively). Relative to other attributes, satisfaction with proactive thought leadership and innovation is low and stands to be a potential way to strengthen advisory offerings and client relationships. As plan sponsors look to migrate from a static benefit offering to a retirement outcome approach, advisors that are willing to initiate conversations and function as a “trusted advisor” and “thought leader” in terms of products, fees and service offerings will likely deepen plan sponsor loyalty and position themselves in a more meaningful way for garnering additional future business. This report represents excerpts from a more comprehensive study that was developed to establish a baseline for service levels in the retirement plan advisor business. The metrics described and the benchmarks established are unique to the industry and proprietary to Chatham Partners. More detailed and actionable insight can be derived by understanding how individual advisory firms compare to the competitive market as a whole. For more detail, please contact Chatham Partners.